Lorem Safety enhanced laboratory gas burner with touch free IR-sensor and button function. Fuego SCS with new functions & graphic display. The Fuego SCS represents a new status among laboratory gas burners. 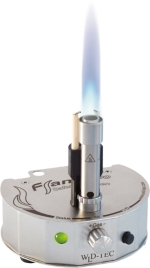 The Fuego SCS provides maximum safety and highest convenience for all flame-related applications in the laboratory. Fully automated carrousel for flame sterilizing inoculation loops. 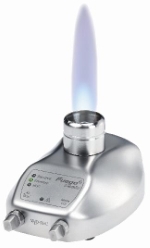 The Fuego SCS basic represents a new standard among laboratory gas burners. With its innovative design this laboratory gas burner is suitable for all flame related applications in the laboratory. Frame 100 - sets new standards in the Bunsen burner class! The Flame 100 is ideally suited for all flame related applications in the laboratory. The 15 millimeter precision flame allows graduated heating of dental tools as well as safe sterilization of microbiological instruments. Flame size and intensity can be adjusted infinitely. The electrical sterilization system SteriMax is most suitable for the sterilization of inoculation loops, needles and instruments. It is ideal for laboratories and safety cabinets where the use of gases and open flames is not permitted. 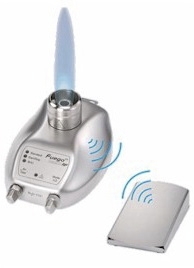 The Fuego SCS basic RF represents the complete system of the new Wireless-Series “RF“. The modern radio operation is already integrated in the safety laboratory gas burner. The mobile handheld laboratory gas burner powerjet 2 - The solution for all flame sterilization work in the microbiology or biotechnical fields. The burner is lit as soon as the bar is pressed. The flame can be regulated in size and is extinguished by release of the bar. Additionally the bar of the powerjet 2 is equipped with a locking device. This locking device comprises both short and longterm ranges. Turntable for inoculation of Petri dishes with touch free IR sensor technology.